The Miami airport shuttle offers transportation services to Orlando, Ft Lauderdale, Port Canaveral, Ft Myers, Tampa, Naples and many other cities we serve in the east and west coast of the state of Florida. We also cover the major airports and seaports as well. The Miami shuttle bus is one of the most affordable and convenient way of transportation that gives you an opportunity to travel with ease to any of your favorite city within the state. Including the Miami to Orlando shuttle bus and Miami airport to Port Canaveral shuttle. If you intend to travel from Miami to Orlando, Tampa, Fort Myers, Fort Lauderdale, Naples and over 40 more destinations in Florida, choose one of your options below. Our daily shared shuttle bus from Miami offers you the most economical transportation in all the major cities we serve through East Coast i-95 and West Coast i-75. It is called a Miami shared shuttle transportation. By using our most flexible Miami private transfers you can travel from anywhere in Miami to your desired destinations anywhere in Florida. It is a door to door service at your own time and place of pick up and drop off. Our Miami shuttle bus offers a transportation services between Miami to all the major cities we serve through East Coast and West Coast in the state of Florida. There are different Miami passenger transportation providers that departs an hour later or earlier depending on where from you are getting picked up. There are different places to depart: Miami International Airport (Regency Hotel) and Miami Downtown (Holiday Inn Hotel). There are various routes for the transportation services depending on the Miami shuttle service trip you choose. If you intend to travel from Miami to Port Canaveral and/or Cocoa Beach, you will most probably be traveling through (I-95) or Florida's Turnpike. In case if you need to use a shuttle bus service from Miami to Tampa and/or Davenport, you will most likely be traveling through (I-75) or (I-4). 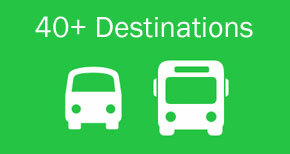 It is important to remember that the above routes depend on the travel plan you choose. For our door to door service in Miami, the area restrictions apply. If your required address for the pick up/drop off is going outside the available pick up/drop off main station radius which is (3 miles), we will choose the closest main station to your city and will inform you via e-mail. Any questions regarding the door to door transportation services in Miami, please get in contact with us and one of our travel specialist will be able to assist you. Thank you! Florida is famous all over the world because of the wonderful theme parks, beautiful lakes, eye catching places and of course the amazing beaches. Travelers, visitors and also Florida residents, everyone love to visit different places within the state. There are many fun Spots to visit in Florida. So, if you're planing for a vacation there, we would like you to visit the Miami Official site and/or take a look at our Travel Blog below for more information. Enjoy and Bon Voyage!